A man of lively imagination, Father Sorin named his fledgling school in honor of Our Lady in his native tongue, “L’Université de Notre Dame du Lac” (The University of Our Lady of the Lake). On January 15, 1844, the University was thus officially chartered by the Indiana legislature. 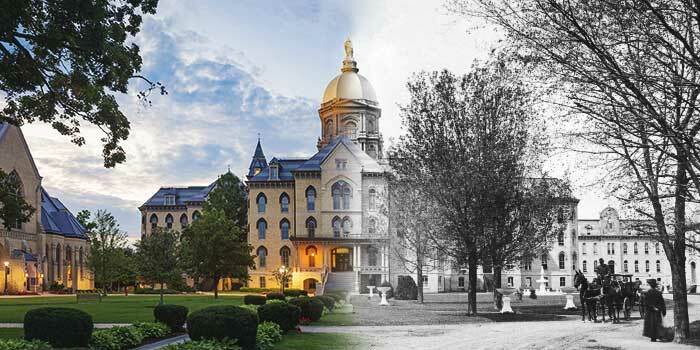 Strong connections exist between Notre Dame’s founding and early life and today’s University. While this is especially true of its roots in the Catholic intellectual tradition, it’s also observed in some lesser-known moments in history that show how Notre Dame has carried out its mission as a residential campus where scholars have pursued their inquiries for 175 years. The research taking place here and the spirit that exists here are reflections of a past marked by firsts and faith. Notre Dame is a place that uses tradition as a foundation for its life and work. Our intellectual and spiritual heritage propels us forward. In 2017, Notre Dame marked its 175th anniversary.